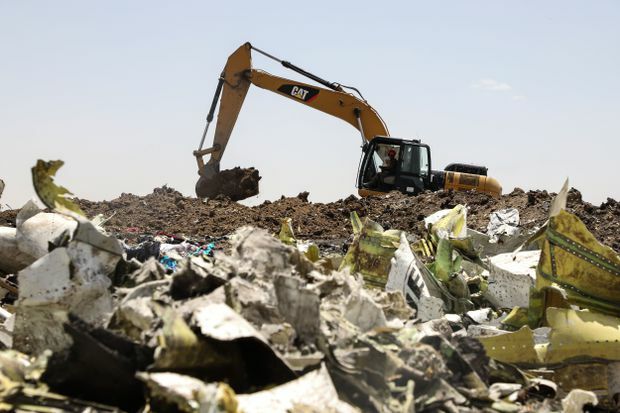 World Black boxes from crashed Boeing 737 Max 8 arrive in Paris after Ethiopia refuses to send them to the U.S.
Black boxes from crashed Boeing 737 Max 8 arrive in Paris after Ethiopia refuses to send them to the U.S.
A power shovel digs at the site of a crashed Ethiopian Airlines plane, near Bishoftu, Ethiopia, on March 11, 2019. Two black boxes from the crashed Boeing 737 Max aircraft have arrived in Paris for expert analysis after Ethiopian Airlines decided to send them to Europe, rather than to the United States, where the Boeing 737 Max 8 was manufactured. The decision is in defiance of U.S. requests in the wake of an Ethiopian Airlines Max 8 crash on Sunday near Addis Ababa that occurred just six minutes after takeoff, killing all 157 people on board, including 18 Canadians. The United States and Canada moved to ground the Max 8 on Wednesday, at least a day after many countries – including China, Australia, Germany, France and Britain – had already taken that step. Before the U.S. and Canadian actions, the two countries were largely isolated in allowing the Max 8s to continue flying. Ethiopian Airlines officials told reporters Wednesday that they had decided to send the voice and data recorders to European safety experts. Later in the day, they said the devices would be sent to German aviation authorities, but the German authorities soon responded that they could not analyze the black box because it was a new aircraft with new software. By Wednesday evening, it was unclear where the black box would be sent for analysis. In recent days, U.S. officials had been quietly pushing for the black box to be sent to the United States for analysis, according to a report in The Wall Street Journal. The decision by the airline to reject the U.S. requests is unusual because the black box is not normally sent to a country that was not involved in a crash. Also on Wednesday, Ethiopian Airlines said that moments before the crash, the pilot reported a flight-control problem, and that there was no indication of any external cause for the issue. Several pilots in the United States, China, Indonesia and elsewhere have complained of difficulties in controlling the airplane, according to a growing number of media reports from around the world this week. The Ethiopian Airlines crash was the second involving a Max 8 within minutes of takeoff over the past five months. In the previous incident, a Lion Air Max 8 in Indonesia crashed after just 13 minutes in the air, killing all 189 people on board. Both were newly delivered planes. At a news conference in Ottawa Wednesday, Transport Minister Marc Garneau said he made the decision to ground the planes after obtaining new data from aviation experts who found similarities in the satellite-tracked flight paths of the two Max 8s that crashed. Until Wednesday, the U.S. Federal Aviation Administration had insisted that there was no reason for grounding the Max 8 aircraft. It said a review had found “no systemic performance issues.” But most other regulators and airlines worldwide took a much different position. The chief executive officer of Ethiopian Airlines, Tewolde Gebremariam, told reporters that all Max 8 aircraft globally should be grounded until their safety has been established. He noted the similarities between the Ethiopian and Lion Air crashes. In an interview with the BBC, he said the airlines that grounded the airplane “have very good justification” for their decision. Ethiopian Airlines also said it is reconsidering whether to proceed with an existing order to purchase more Max 8 aircraft, adding that it will decide after an investigation. Kenya Airways, one of the biggest airlines in Africa, said this week it may reconsider its earlier tentative plans to buy as many as 10 Max 8s for its fleet. The Ethiopian Airlines flight on Sunday was headed from Addis Ababa to Nairobi when it crashed. The disaster killed 32 Kenyans – the largest number of victims from any single country. Prime Minister Justin Trudeau spoke with Kenyan President Uhuru Kenyatta by telephone Tuesday to give his condolences for the Kenyan victims and to offer Canadian assistance in the investigation of the crash. Ethiopian Prime Minister Abiy Ahmed said Mr. Trudeau telephoned him on Wednesday to give his condolences over the Ethiopian victims and to express support to the Ethiopian people and government. Mr. Trudeau “shared his faith in the national carrier” and pledged that Canadian officials will continue to fly on Ethiopian Airlines, Mr. Abiy said.